A 4-goal win over Fitzroy at Brunswick Street Oval got the Blues' season off to a bright start. Goalkickers: T.Carroll 5, G.Hardie 3, J.Gill 2, I.Collins 1, G.Collis 1, B.Cox 1, J.Nicholls 1. Reports: Injuries: J.James (cork thigh) by B.Varlarmos in second quarter. B.Williams (bruised hip) by P.Falconer in last quarter. With our previous season's top goal-kicker; Tom Carroll, in good form, the Blues started the season with this emphatic win over Fitzroy at the Brunswick St. oval. A dominant second quarter where the Blues outscored the Lions by 40 points set up a match winning lead. 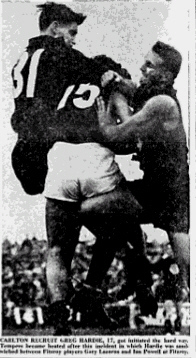 An angry third-term clash, which followed after Hardie, of Carlton, had been knocked down when marking near goal, was the turning point in Fitzroy's form. In the final term Fitzroy inspired by it's captain Kevin Murray out scored the Blues 4.5 - 1.1; despite this revival Carlton ran out winners by 23 points. Page last modified on Tuesday 22 of October, 2013 08:30:43 AEDT by blueycarlton. 1991 Rd 3 - Madden using his basketball skills on Reynoldson. 2000 Rd 17 - Match Summary Vs Hawthorn.